Browse these endless lists of dishes (which also find their way into Ulysses), and you’ll almost assuredly find a soup or two. 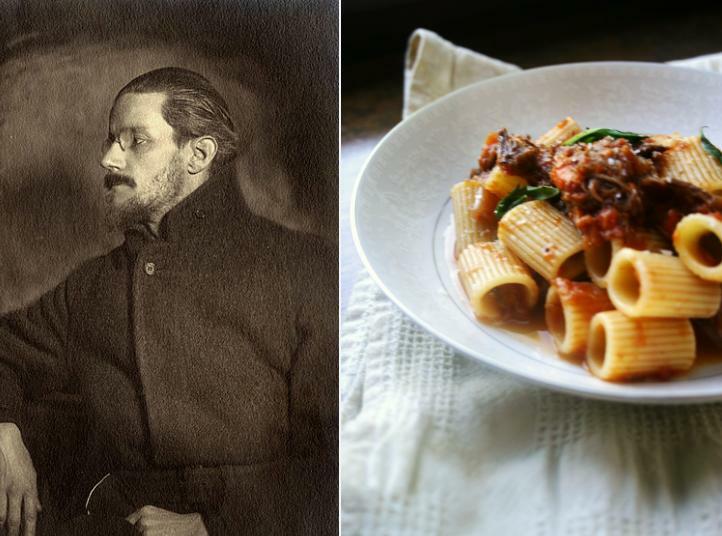 Joyce constantly mentions soups and stews in both his letters and his novels; “thick giblet soup” is a favorite of Leopold Bloom, although Joyce has a particular fondness for stracotto, a braised pot roast served with pasta, which he discovered while living in Trieste. It’s a hearty dish, more suitable for a stick-to-your-ribs winter meal than for middle-of-summer Bloomsday, but Bloom’s meals weren’t particularly seasonal either (Kidneys? Cocoa and cider? In June?). This is one of those one-pot wonders with flavors so rich, you’ll wonder why it wasn’t more work. As my roast simmered away on the stove, I remembered what Joyce wrote while struggling with Ulysses: “The ingredients will not fuse until they have reached a certain temperature.” More effort doesn’t always mean a better result. Sometimes it’s just a matter of letting the flavors meld. 1. Pat roast dry with paper towels and season with salt and pepper. In a large pot over medium heat, add 1 tablespoon oil until hot but not smoking. Add meat and brown on both sides, about 12 minutes total. Transfer to a platter and set aside. 2. To the same pot, add remaining 1 tablespoon oil and the onions, carrots, celery and garlic. Sauté over moderately high heat until softened and golden, about 5 minutes. Add wine, stock, tomatoes, thyme, oregano, bay leaves and chile flakes and bring to a boil. Reduce heat to low. 3. Return roast with any juices on platter to pot and cover. Braise, turning over once every 30 minutes, until tender enough to shred with a fork, about 3 hours. Add additional wine as needed, if sauce reduces too much. 4. Transfer meat to a cutting board and allow to cool slightly. Meanwhile, discard bay leaves from sauce and, using an immersion blender, purée sauce until texture is thick and even. Cut meat into 2-inch chunks, then shred with 2 forks. Return shredded meat to sauce, and season with salt and pepper. 5. Cook rigatoni in a pot of boiling salted water until al dente. Drain, reserving 1/2 cup pasta water. Stir water into sauce, then add pasta and stir to coat. Top with grated cheese. Now, THAT is a very proper ragu! Those last two lines really resonated with me. Letting ingredients do the heavy lifting is something I don’t do enough, but, when I do, the results are usually so satisfying. So glad you found me. I love his letters to Nora, although some of them get quite scandalous. The kitchen definitely brings out the “passion,” for sure! While I admit that I don’t very often stray from my list of tried and true supper recipes, your blog is my absolute favorite. Learning about their favorite foods adds a touch of the personal that’s so hard to come by. I just love it! Excellent post! And my word that recipe looks heavenly! I don’t know how I am going to be able to eat any more Rigatoni and not smile and think of your blog! Thanks for making my day! Thanks for reading! His letters are a riot. Pasta and literature – me likey! Will have to try this recipe out. Excellent post, as always! And congrats on the Freshly Pressed! I love any braised dish, especially if it includes pasta. Wow! Great post. Thanks for sharing and congrats on being freshly pressed! It was good shrimp, anyway. Great post. 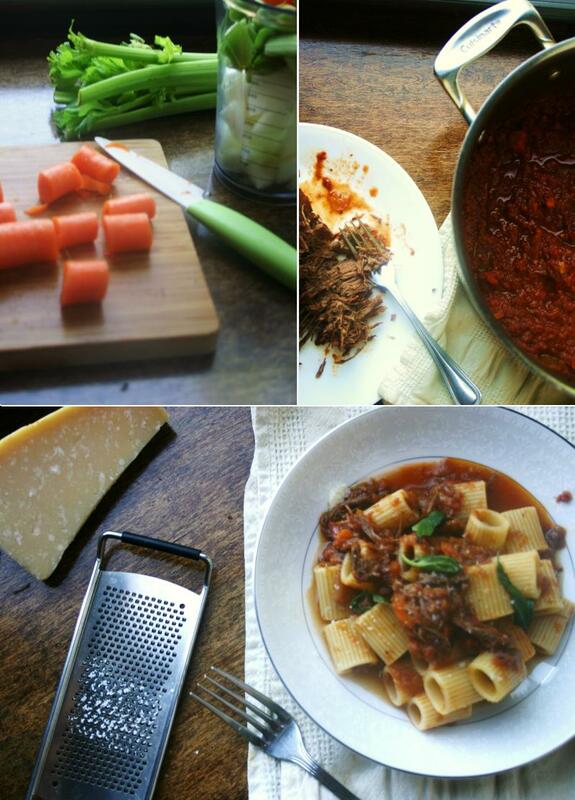 I’ve made something similar but using short ribs – slow cooked in tomato sauce, then deboned and shredded. It’s delish. Beautiful recipe! Reminds me of The Leopard. Happiness and passion in the Kitchen, so true 🙂 now you have tempted me to read the letters to Nora! I remember when leading tour guides around Dublin (I was at college at the time); I learnt a few very funny facts about James Joyce. He has a very little statue; too! Lovely post.. Made me very hungry though!! Following, because I`m from Ireland, and because I have a love/hate relationship with Joyce. What a fun post! Love the combo of celebrating Joyce along with a super delicious sounding recipe. This post is the discovery of the day for me. Have been browsing Internet for inspiring recipes for the whole day, and here I find a different kind of inspiration, more than loading the daily calories into my stomach. I will definitely step by once in a while for some more inspiring reads. Great post! I love food and books myself and that picture looks so delicious I’ll have to make it now. Original. An interesting point of view. That looks so delicious. Definitely going to try it out! I’m always looking for new recipes…I have one of the pickiest little eaters ever, so I am glad I happened on this post and am soon to have a go at Rigatoni. Going to try this recipe. Hello! I just discovered your blog through my friend Emiko’s blog. How wonderful to discover it! I love historic cookery books and recipes and cover them on my blog so it is clear why I love your work. I look forward to reading more! So glad you found me – I love your blog! Going through old cookbooks is such a treasure hunt. Can’t wait to see what you do next! What a gorgeous dish. I love a hearty plate of pasta. Lovely photo too! I’m convinced my last meal would be a plate of pasta with bolognese – and a huge chocolate cookie. Can’t beat it! Clearly you haven’t had the joy of Dublin in summer if you think kidney’s can’t be June food. Unfortunately Ireland tends to lose defined seasons in a sea of grey. Lovely post, I really enjoyed reading it and getting more insight into Joyce. Despite growing up minutes from the tower where Ulysses begins, and swimming regularly in the ‘scrotumtightening sea’ there, I have never managed to make it through the whole book. One day.. Wonderful – hope you enjoy it! I can see eating this in the middle of an Irish summer. Brr! I love (and studied) Irish literature and this post was such a joy to read. The insights into Joyce’s love of food and of Nora were especially enjoyable. In fact, the kidney is famously eaten for breakfast at home (slightly burnt), not in a pub. Mr Bloom more famously eats a Gorgonzola sandwich in the pub for lunch.